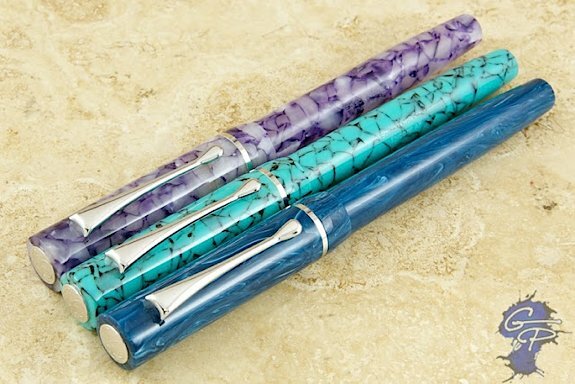 Edison Pen Co – Farewell, Encore! Edison and Goulet have come to a difficult decision regarding the Encore. It will be discontinued. Whatever inventory left is currently with the Goulet’s, and is being sold at a discount. When these pens are gone, they are gone. This was a bit of a difficult decision, as personally, the Encore is one of my favorite pens! The LE Encore is still my daily writer, and has been for the last year! Bottom line, the Encore was a fairly popular pen, but not as popular as the rest of the Production Line, and it didn’t sell with the volume required for us to keep it at a production pace. The lower demand had a lot to do with price. The main driving factor behind this was the cast medallion in the finial. Although I feel that it’s gorgeous, they aren’t cheap to manufacture, and this drove the retail price higher than any other Production Line Pen. So this decision is probably best, and then we will move onto some other projects that will also be unique and appealing in the near future, so stay tuned! Please visit the Goulet Website for more information as well as a video from the Goulets regarding this decision. Price of the pen will be marked down from $165 to $145. Click here to buy this pen before they are gone! I hate to say this but I truly feel that those pens would have sold much better of the selection of finishes would have been better. I absolutely hate those the purple and the turquoise pens. The bluish one is better by default but it to me was lackluster. I purchased the Encore LE and what a beauty it is. Everything complimented the pen. The ones you’re discontinuing is just a disaster to me. I really don’t think cost was the deciding factor. People buy expensive pens all the time. Its another thing to buy an expensive unattractive pen. This is my two cents worth. I think the pen is worth anither try with better looking finishes. Hi Terea. Thanks for the comment! It’s all personal taste. There were lots of people who loved these colors. Personally, I love the Blue Agate and Purple Dew. But I’m not a big fan of the Turquoise. One of the most difficult items to do it pick three materials that will appeal to everyone! When the Beaumont came out I thought "um wow, that is very very very similar to the Encore, only with infinitely better colors options. That might hurt sales for Goulet." So I’m not exactly surprised nor saddened.